A little late for new year’s resolutions, but I am always up for a challenge. This has resulted in the 2013 knitting challenge. I have roped in 2 others: Lisa Boucher and Jasmine Esbach to take part in this knitting challenge. They agreed to be named, as that might provide them with additional incentive to see it through! What does the 2013 knitting challenge entail? In short, we are going to each knit a blanket, as shown in the picture. It is made up of 108 squares. Do you have to finish it by the end of the year? No, we have chosen to use the Financial Year (1 April 2013 to 31 March 2014) as the year for our knitting challenge. It looks very complicated. Is it? Although it may look difficult to do, but each square is in fact very easy to knit. I have made the pattern to knit a blanket available. Can anyone join your challenge? Absolutely! In fact, I have demystified the pattern, as everyone I have spoken to, finds knitting patterns difficult to decipher and generally gives up before they have started. If you’re keen to join in, let me know. Either leave a comment, or tweet me @liezlhesketh. Hello! I am on square 14 & really enjoying it…very relaxing & feel a sense of achievement after each square. 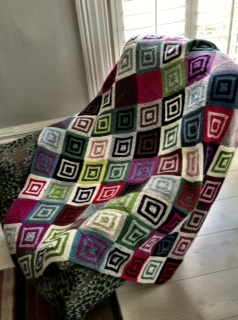 You can also be very creative with this pattern, I have chosen colours that I love & enjoy putting them together. I cannot wait to see the end result!